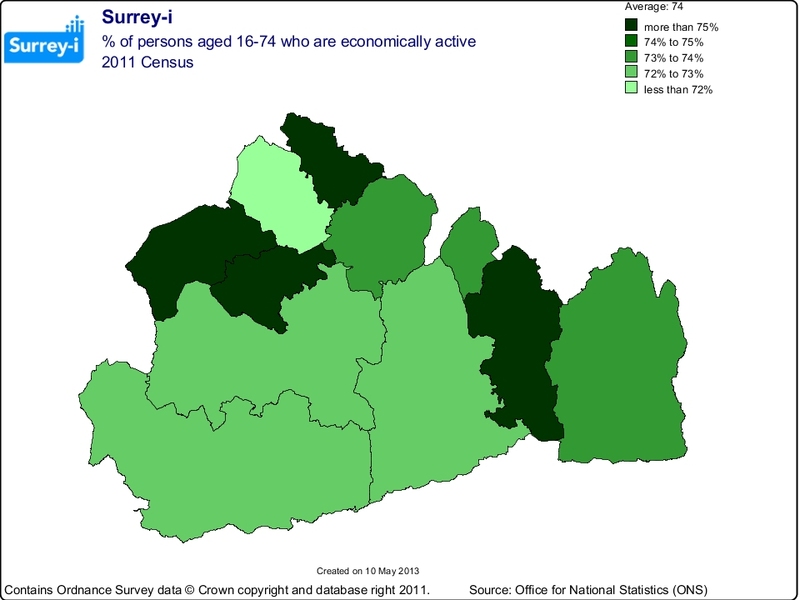 The total number of economically active people aged 16-74 (employees, the self employed, the unemployed and working students) in Surrey in 2011 was 601,791, compared with 547,635 in 2001. This is an increase of 54,156 or 9.9% since 2001. Economic activity rates for men in Surrey at 79.8% remained almost unchanged compared with 2001 (79.4%). Whereas the 67.7% rate for the women was higher than in 2001 (63.3%). 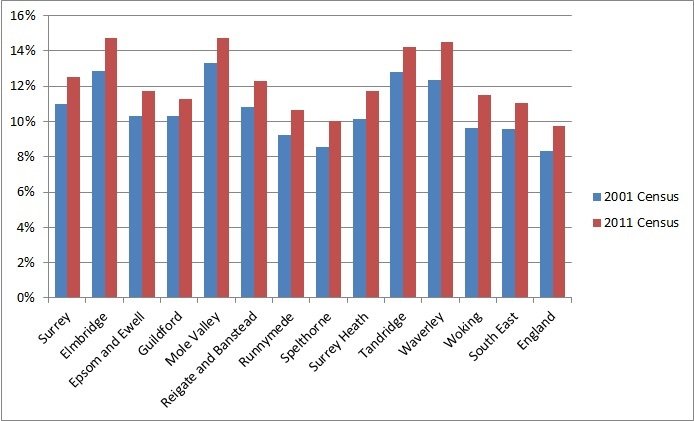 Surrey economic activity rates were higher than in England (75.2% of men and 64.7% of women) and higher than rates for the South East region (77.6% and 66.7% respectively).The boroughs with the highest percentage of economically active people were the same as in 2001, all showing in 2011 a small increase: Spelthorne (75.5%), Woking (75.4%), Reigate & Banstead (75.2%) and Surrey Heath (75.1%). 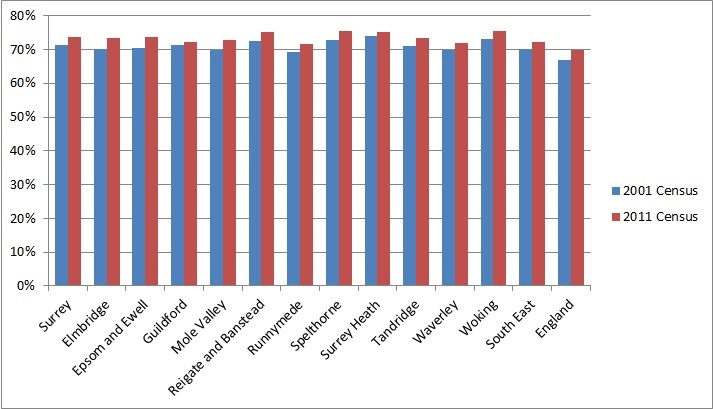 The greatest numerical increase in the resident workforce between 2001 and 2011 were in Reigate & Banstead (+8,740), Elmbridge (+6,928) and Woking (+6,480). 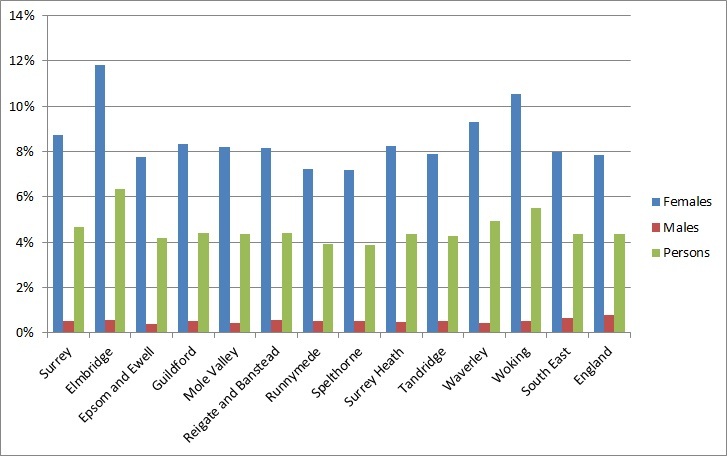 The largest percentage increase was in Epsom and Ewell (16.5%). The number of economically active residents increased in all the Surrey boroughs. 42.2% of Surrey residents aged 16-74 (344,923 people) were in full time employment in 2011, compared with 341,270 or 44.4% in 2001. 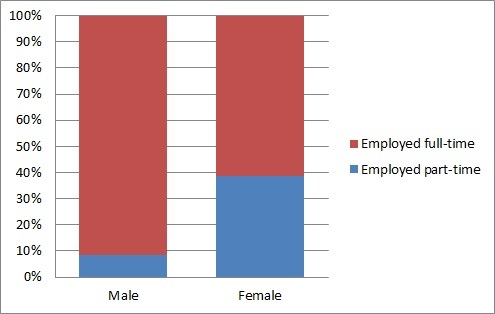 This level of full time working was higher than the England average of 38.6% of residents. There were particular concentrations of full time working among residents living in the Boroughs of Spelthorne (46.5%) and Woking (45%). Surrey has a relatively large proportion of self employed residents (102,486 or 12.5% of all aged 16-74) compared with 9.8% in England and 11% in the S.E. Region. This was 17,936 (21.2%) more self employed in Surrey than in 2001. There were particular concentrations of self employed in the districts of Elmbridge and Mole Valley (both 14.7%) and Waverley (14.5%). 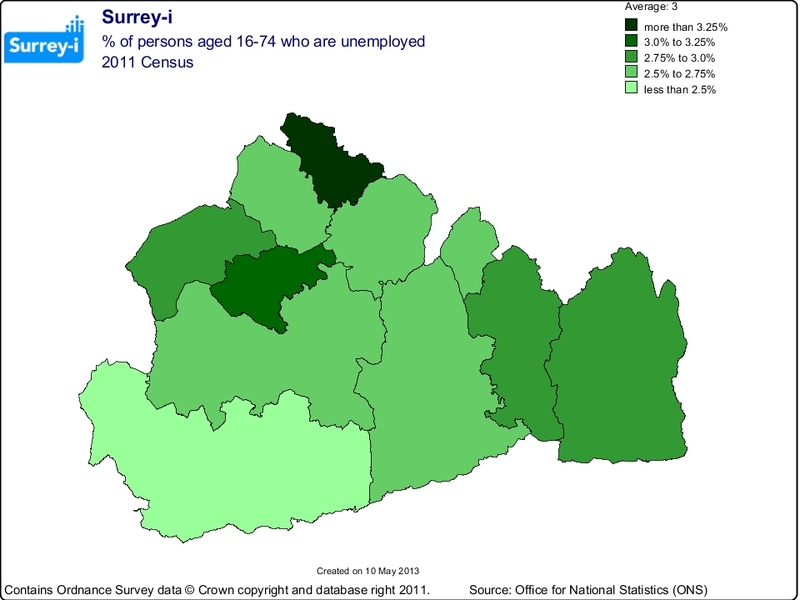 2.8% of Surrey residents aged 16-74 considered themselves to be unemployed in 2011. This was lower than the rate for England (4.4%) and higher than the rate in 2001 (1.7%). 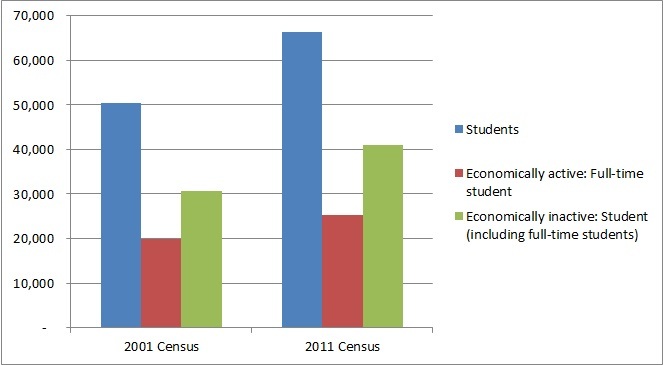 The total number of students aged 16-74 in Surrey in 2011 was 66,224, which represents an increase of 31% since 2001. The boroughs with the highest percentage of economically active students were Guilford (4.9% of the residents aged 16-74) and Runnymede (4.8%), reflecting the presence of the Royal Holloway and Surrey university campuses. 12.9% of Surrey residents aged 16-74 were retired (105,585 people). This was slightly lower than the S.E. Region and England rates of 13.7% and lower than in 2001 (113,757 people). 4.7% of Surrey residents aged 16-74 (38,200 people) did not work because they were looking after the home or family. This proportion is very similar to the South East and England rates of 4.4% and lower than the rate in 2001 (6.9%). The percentage of Surrey residents aged 16-74 who were not working in 2011 because they were permanently sick or disabled was 2.1%, half of the England rate of 4.1%. This was 16,744 people compared to 18,661 in 2001.